These days I like to get on my bike and go for a ride, partially for exercise, but mostly for the simple pleasure of feeling the heat of the sun on my skin. Everything here seems to relish that pleasure, from the ducks swimming in sun-drenched ponds, to the trees in full greenery again, to even the buildings of the city skyline, which appear to be basking in the sun. During these days of midnight sun, it’s easy to lose track of the hour and find myself pedalling home later than planned. 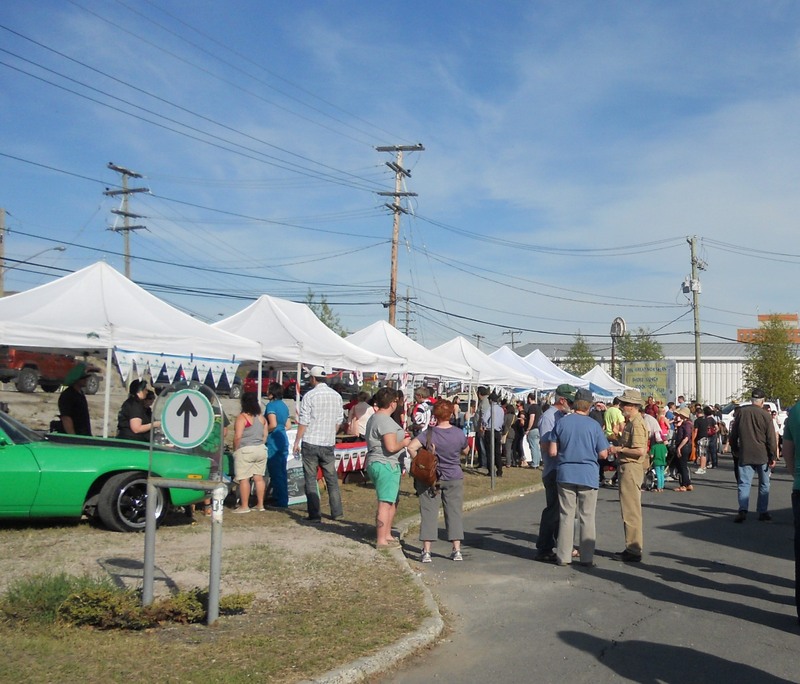 With the long hours of sunshine also comes a glut of events, all competing for the distracted attention of Yellowknifers. Rather than dissipate my energy by trying to attend them all, I decided to check out any outdoor ones that I came across while cruising around on the purple rocket. 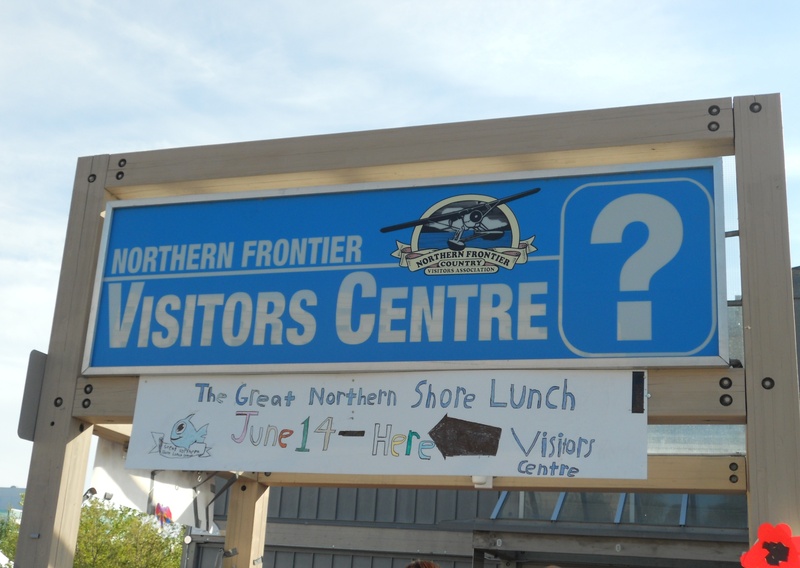 The Northern Frontier Visitors Centre hosted the first of what is planned to be an annual event, The Great Northern Shore Lunch Cook-off. A shore lunch is supposed to involve freshly-caught fish that is cooked on the shore of the body of water where it was caught. But in this case, fresh fish was trucked in and various teams showcased their best recipes in a fish-fry (which is actually a fish-grilling) competition. In addition to the judges, a hungry public was eager to sample what the various teams offered. We’re quite spoiled in Yellowknife by the easy availability of so much fresh fish in the wild. The fish-farm version pales in comparison. By the time I got there, some 2+ hours after the start of the event, I was hungry from my ride. But I wasn’t the only hungry one, as the lines in front of the team tents were dishearteningly long. Evidently the cook-off was patronized beyond expectations, because supplies of fish were running out and I could no longer buy meal tickets. Of course, you’re never in a jam for long in Yellowknife. I ran into a friend who gave me her leftover tickets and when the lines died down, I managed to get the tail end of a meal (no pun intended). Later during the evening, there was a Battle of the Bands, where local bands competed for a cash prize. But I ate and ran (or pedalled), so I didn’t watch it. The next event I cycled by was an amusing one. The francophone community had a weekend job of charming Acadian singer-songwriter Edith Butler, for La Petite Seduction, a show on French-language TV. 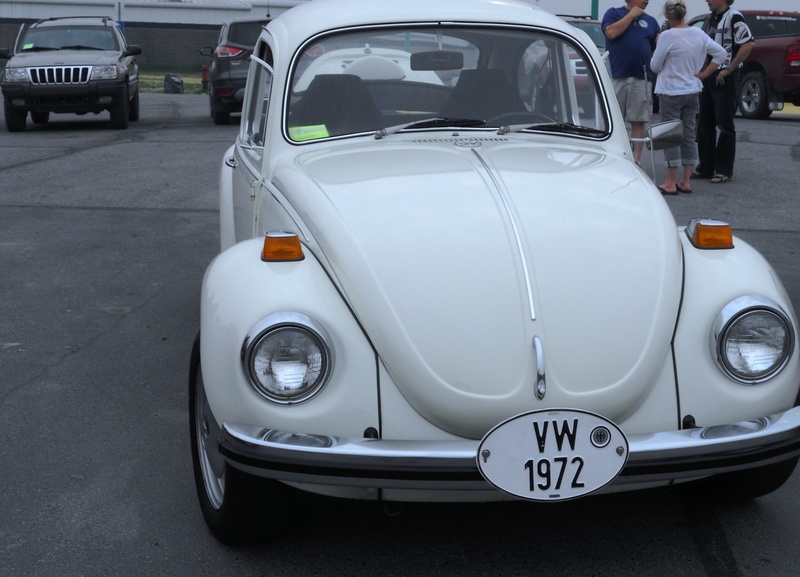 In the show, a well-known personality visits a small town and is feted by the locals. The goal is that by the time she departs, she’s been utterly captivated by the town. 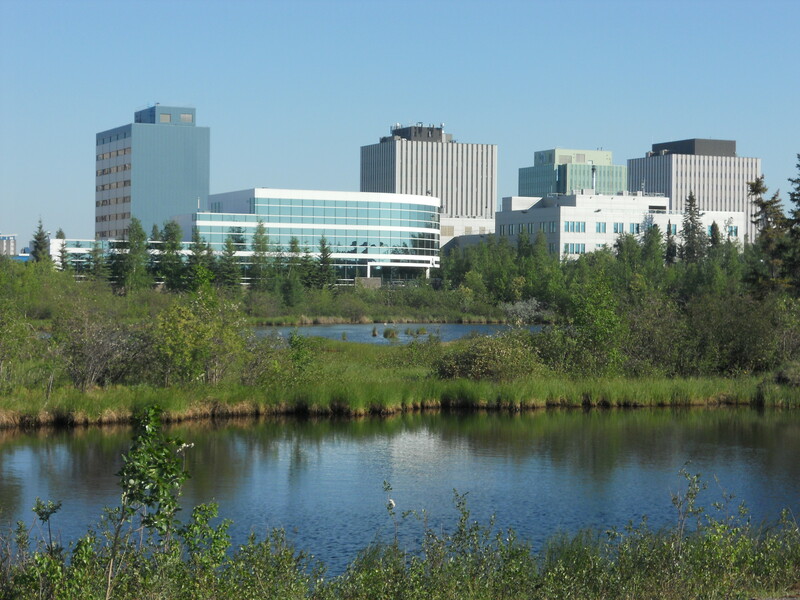 It’s quick work for Yellowknifers, because it’s easy to be seduced by this town. Fans of the singer (and of the show) turned up early in the mornings, to treat her to various events and tours. I stopped by the final Sunday celebration in Somba K’e park. Host Danny Turcotte gave a humourous tribute to the singer, interspersed with lively music and the crowd singing along. The guest of honour spoke, of her reaction to learning of the trip, and of her impressions of the town. 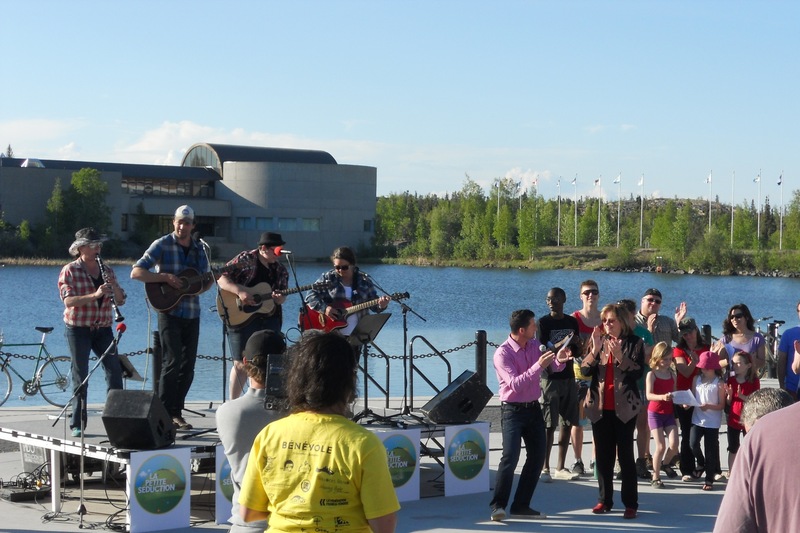 There was an impromptu bit of “This is Your Life”, when someone she had sung with decades ago, who now lives in Yellowknife, was called up on stage to surprise her. It’s a small world indeed. The official programme ended with a barbecue. 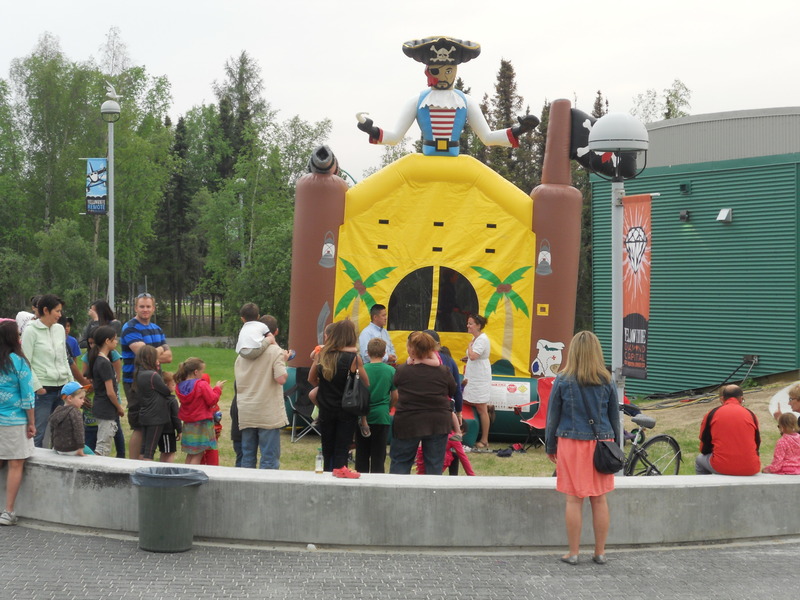 Not to be outdone, the City of Yellowknife decided to charm its residents, by throwing a free community barbecue in Sombe K’e Park, one Thursday after work. It’s the purest of coincidences that all of the events I happened to stop by involved food. When I arrived, the barbecue grills were running non-stop, with the mayor being one of the grill-meisters, and the lines of burger-lovers snaked along forever on both sides. No mere burger was worth me joining that line, and if I had been hungry, I’d probably have fainted before I got to the top of it. A bouncy castle had been brought in especially for the occasion. It was rather amusing to observe it bobbing and swaying, and to hear the giggles and squeals of the excited children inside. During the summer months, below the tree-line, bush fires are plentiful across the Northwest Territories. It is so dry here that carelessly throwing a lit cigarette, or not controlling a camp fire, can result in a conflagration that consumes huge swaths of vegetation. The fire-fighting resources are no match for the size of the territory, so there’s no choice but to leave the fires in remote places to burn themselves out. Here in the city, we have to deal with the results: a city ban on open fires and we have to endure “local smoke”. i.e. the official weather report term for the smoky air that dilutes the sunshine and creates a hazy look to the city. Sometimes I can even pick up a slightly smoky smell. While the air here is generally clean, this year’s fire season has been the worst in decades. Not that any of that puts an end to any outdoor events. 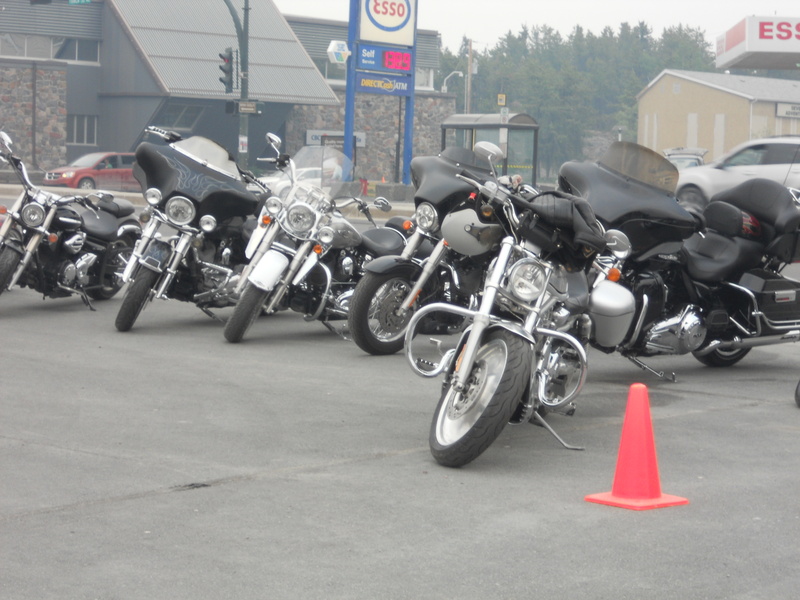 Members of the Northwest Territories Riders Association polished up their motorcycles and fancy cars and came out to put them on display, to run an auction, to socialize…and, of course, to have a barbecue. It was an evening that was hazy with “local smoke”, but everthing shone nonetheless. There were more motorbikes lined up there than I’ve ever seen in one place, and several more pulled up noisily while I was there. 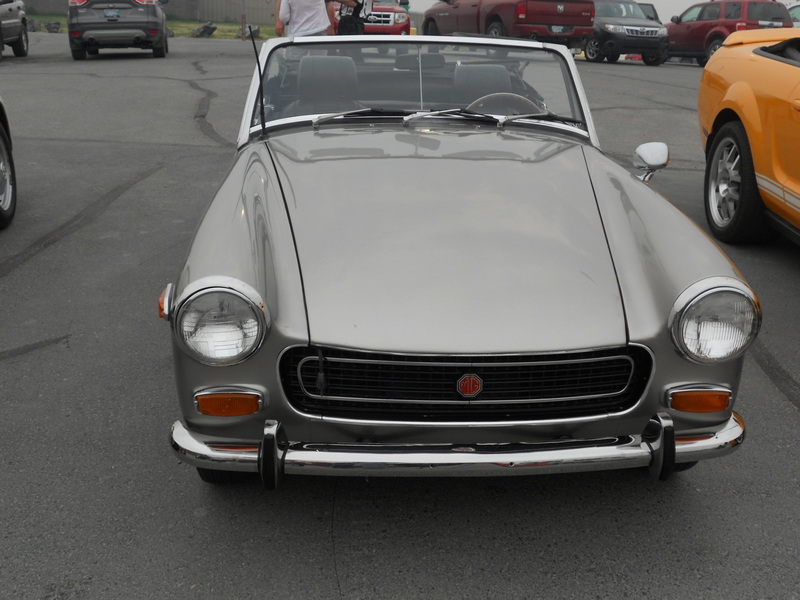 As for the cars, there was something for everyone: some classics, some old favourites, and some pure muscle cars, including one with an engine that screamed testosterone so loudly that evidently no hood could contain it. Super-charged muscle car – vroom vroom! After witnessing such displays of raw power, speed and noise, I got on my purple rocket and headed home, using raw pedal power, at my own speed, and with no noise. Copyright © Kathryn Birchwood and FrozenTrini 2014. The use and/or duplication of this material without the express and written permission of this blog’s author and/or owner are unauthorised and strictly prohibited. Excerpts and links may be used, provided that full and clear credit is given to Kathryn Birchwood and FrozenTrini, with appropriate and specific direction to the original content. I have see you pedalling past on your bike a few times this summer and you look so proud and happy! Love it!